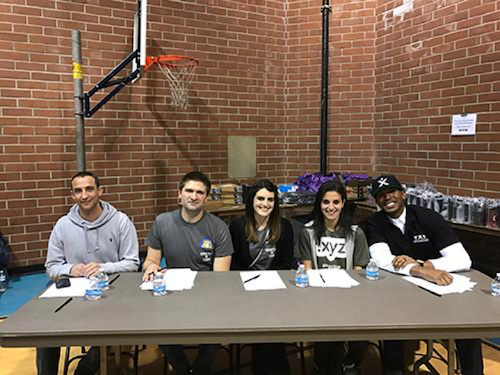 The XYZ Team partnered with Teens Exploring Technology (TXT) earlier this month to bring 300 inner-city youths together in South Los Angeles. Ranging from 12 to 17 years old, these bright students spent their weekend at the 4th annual Hustle N’ Code Hackathon to learn how coding could solve everyday problems in their communities. Among the participants was Los Angeles’ own Mayor, Eric Garcetti, who spoke to the students about the importance of making a positive impact on their communities through science and technology. The objective of Hustle N’ Code is to help the next generation develop solutions to problems that their communities face everyday. Some of these issues include violence, drugs, difficulties in school, stray animals, and homelessness. The participants broke out into groups, where they discussed what issues they wanted to tackle, and how they could be addressed. Each group got to register a free .xyz domain and website builder, then got to work on learning and coding their new websites. At the end of the day, the projects developed by these young old aspiring coders were evaluated by a panel of 5 judges, which included our very own Project Manager, Jana! PawAlert, a website to report and help find lost pets, took first place at the event. Another favorite developed that day was CodeBreakers.xyz, an online platform to manage supplies students borrow from classrooms – the site even emails the teacher when an item is checked out! 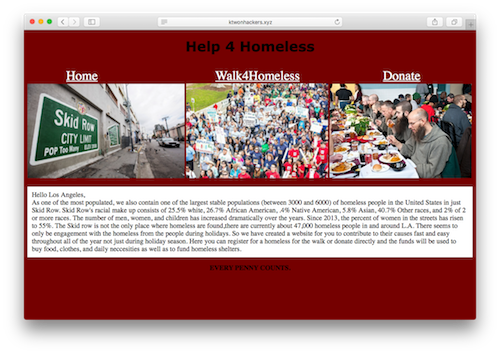 KTwonHackers.xyz also received fanfare for its thoughtful “Walk4Homeless” solution to bring awareness to the plight of the homeless throughout Los Angeles. Although these and the other websites developed at Hustle N’ Code are still works in progress, they are great starts to meaningful solutions for problems that communities in Los Angeles face today. The XYZ Team is thrilled to see our future leaders innovating on .xyz domains at such an early age, and we can’t wait to see the completed projects. 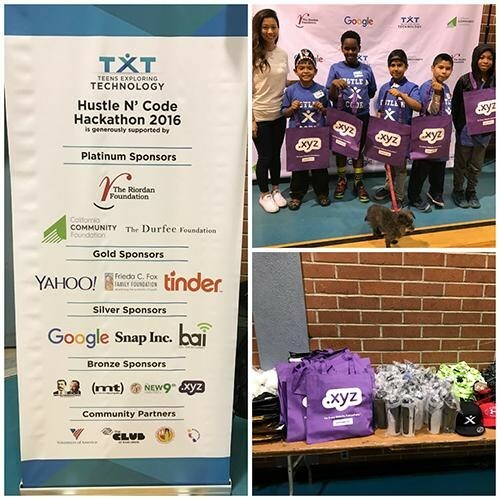 We had a great time at the Hustle N’ Code hackathon, and we really appreciate the work that TXT is doing. We look forward to attending again to continue fostering the next generation of internet users! Next Post » China Blog Series: 2.XYZ, JJ.XYZ, 222.XYZ & more: Exclusive 1-4 character .XYZ auction (NO RESERVE) starting January 4!